Details about getting paid for referring blogs to the network. Are you a regular Fomo user? Log into your dashboard > Account (top right icon) > Referrals to get started. 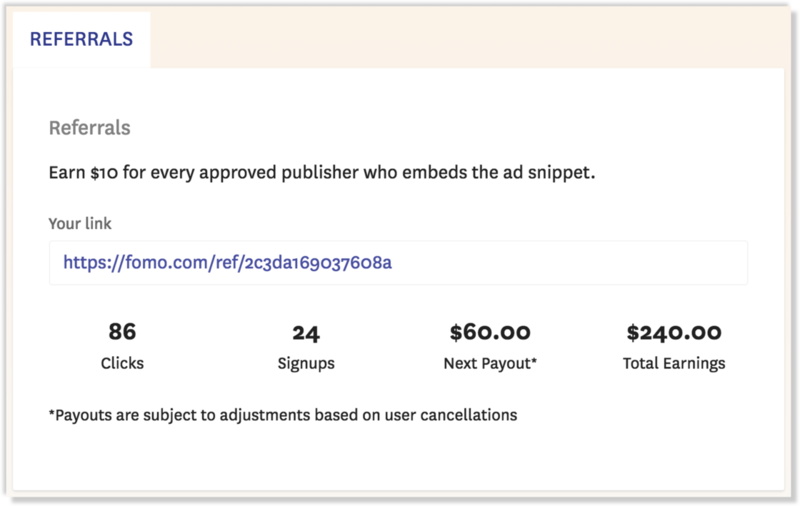 Publishers in the Fomo ad network may refer other blogs and content resources to Fomo for a 1-time payment of $10 per approved referral. Find your unique share link inside your Fomo Publishers dashboard > Account (top right icon) > Referrals tab. Here is what it means to be an "approved" publisher. After signing up, referrals are shown an Embed tab where they can copy/paste their Fomo ads snippet into the <head> section of their website or blog. Note, this must be pasted on the same URL they provided while signing up. For example, a referral cannot input "google.com" as their site, then embed on "some-blog.com" and receive credit for embedding the Fomo ads snippet. As of this writing, we manually approve all new publishers in the network to ensure maximum ROI for our advertisers. Every few days, the Fomo team visits recent referral signups to determine if they are a fit for our network and advertisers' needs. If a referred publisher is deemed inappropriate for our network, they are disapproved and you will see a reduction in your "next payout" field of the Referral portal. Assuming you have at least 1 approved publisher at the end of a calendar month, you will be paid $10 per referral between the 1st and the 3rd day of the following month. => $90 referral earnings for that month. To avoid delays in your payments, make sure a PayPal address has been added to your account profile.